Resident Evil Code: Veronica, known as Biohazard CODE:Veronica (バイオハザード コード：ベロニカ) in Japan, is a survival horror-themed action-adventure game by Capcom and Nextech. It was first released in 2000 on the Sega Dreamcast as an entry in Capcom's Resident Evil series, serving as a direct sequel to Resident Evil 2. Code: Veronica was intended to be a Dreamcast-exclusive, but Sega's departure from the hardware business resulted in the development of an expanded edition titled Resident Evil Code: Veronica X, which was released for the PlayStation 2 the following year. Resident Evil Code: Veronica was a three-way project co-developed by Capcom Production Studio 4, Nextech, and Sega, specifically for the Dreamcast. When the project was first hinted at in May 1998 by executive producer Yoshiki Okamoto, game publications assumed that the project would be the next numbered entry in the series (Resident Evil 4), which had yet to be officially announced at the time. On October 6, 1998, the project was officially unveiled as Code: Veronica, with a tentative release date of April 1999, though this was later pushed back to February 2000. Code: Veronica was codenamed Biohazard 3 during early planning, a title which was ultimately given to the simultaneously-developed Resident Evil 3: Nemesis on the PlayStation. The reasoning for not giving a numbered title to Code: Veronica was due to the title being developed as a Dreamcast-exclusive at a time when numbered Resident Evil titles were reserved for PlayStation consoles, although the game was later ported to the PlayStation 2 as Code: Veronica X. This policy was later abandoned when the actual Resident Evil 4 ended up being developed for the Nintendo GameCube as its main platform. Resident Evil Code: Veronica was Capcom's only Sega Dreamcast title to surpass one million unit sales, selling 1.14 million in total, and became the second Capcom title to do so on a Sega system, after 1993's Street Fighter II': Special Champion Edition which sold 1.65 million on the Sega Mega Drive. It was also the first Japanese Dreamcast title to top 500,000 units sold. 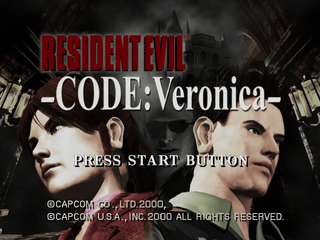 Resident Evil Code: Veronica was re-released in 2001 for the Dreamcast, PlayStation 2 and later GameCube in the form of Biohazard Code: Veronica Kanzenban (Resident Evil Code: Veronica X outside of Japan, although the Dreamcast version was a Japanese exclusive). Kanzenban fixes many of the bugs found in this version and is considered to be the definitive edition of the game. Main article: Resident Evil Code: Veronica/Magazine articles.